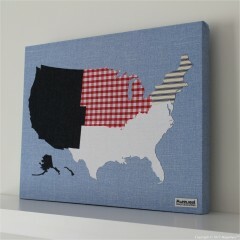 Representing the four census territories of the USA, this map is a fabric slice of pure Americana. 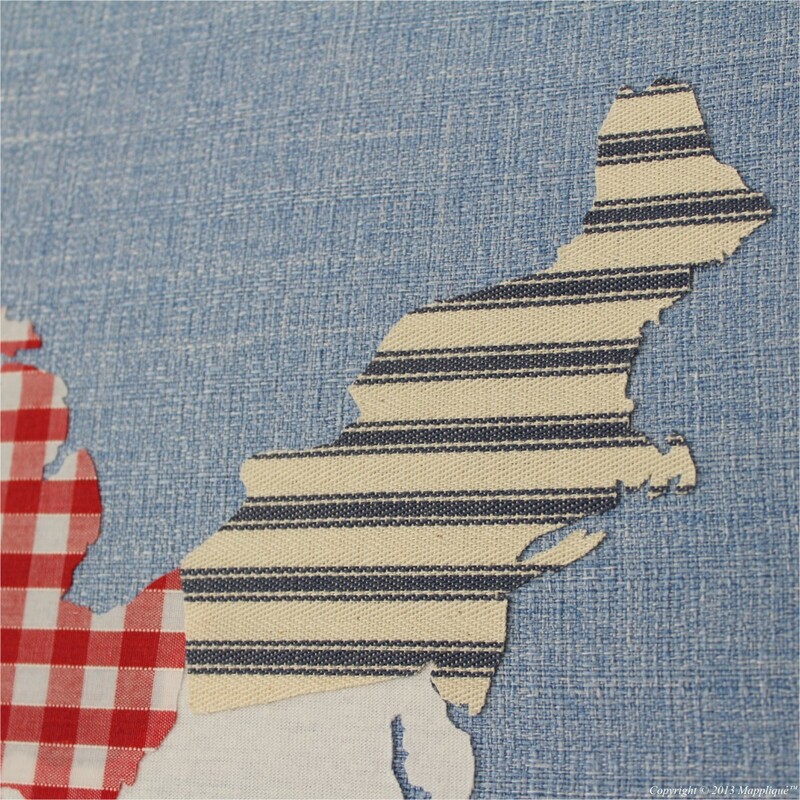 This handcrafted fabric map wall art is made by painstakingly cutting each region out of fabrics relevant to each region and appliquéing them to a base of blue linen-style fabric with a rich woven texture. Fabric is applied to canvas stretched over a light but strong wooden frame, the piece comes ready to hang with cord and is signed with the Mappliqué woven label. Sign up for the Mappliqué newsletter to be notified when they arrive (plus all subscribers get 10% off). Each region is represented by an All-American fabric relevant to the area. 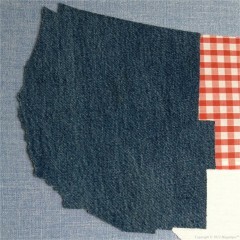 The West is represented with denim. The fabric may have been invented in France, but it took the workwear of Levi Strauss and the iconic cowboys of the Wild West to drive the fabric into the heart of America’s cultural identity. From the Gold Rush to James Dean, denim has become a true American phenomenon. 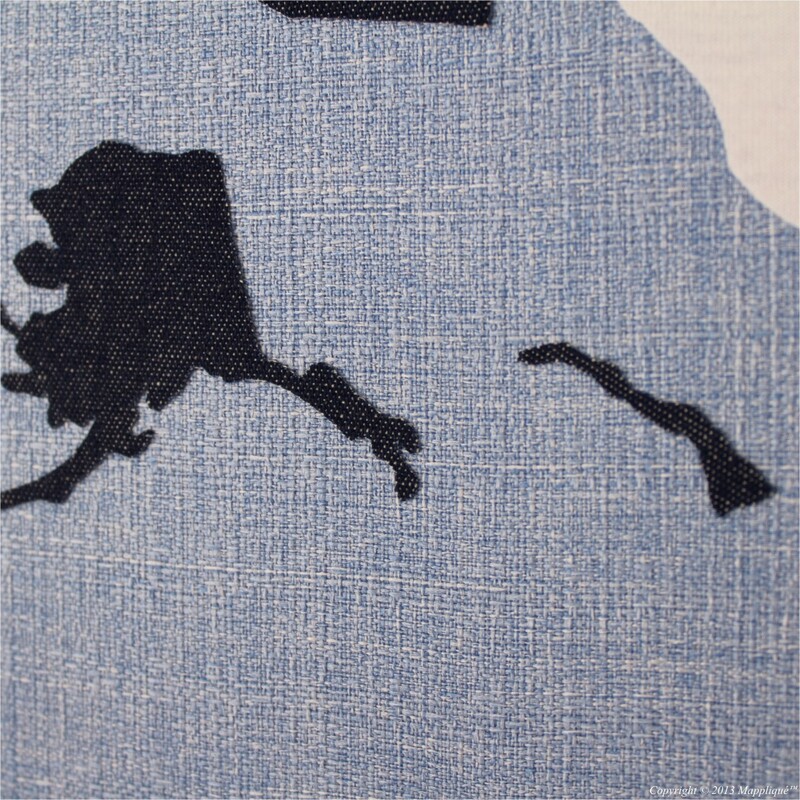 Each fabric map is made-to-order with your choice of dark indigo denim or a lighter, washed “blue jeans” denim. 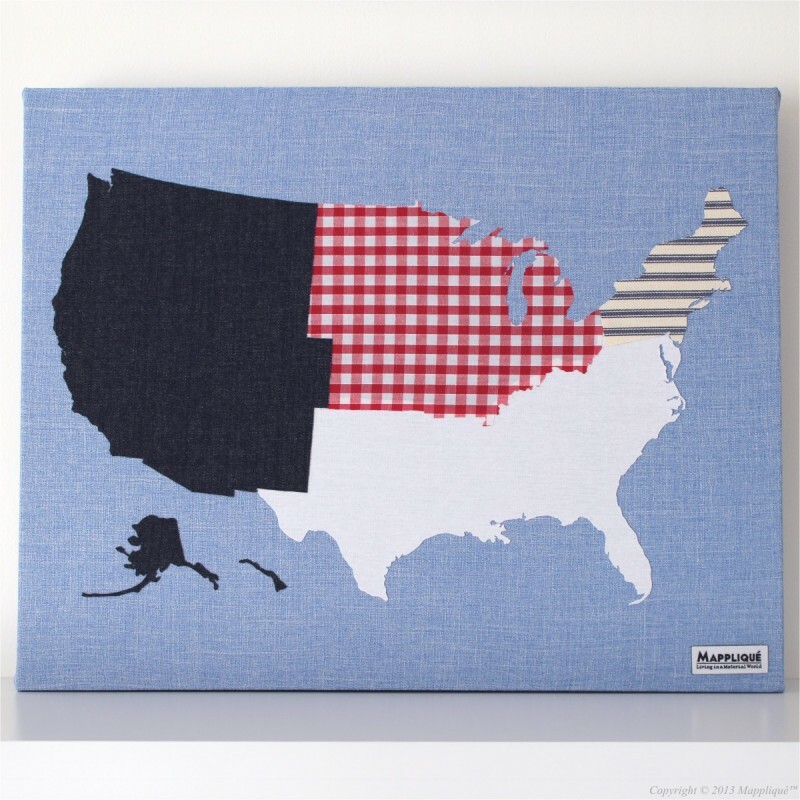 The Mid-West is strongly represented by yet another American icon: gingham. 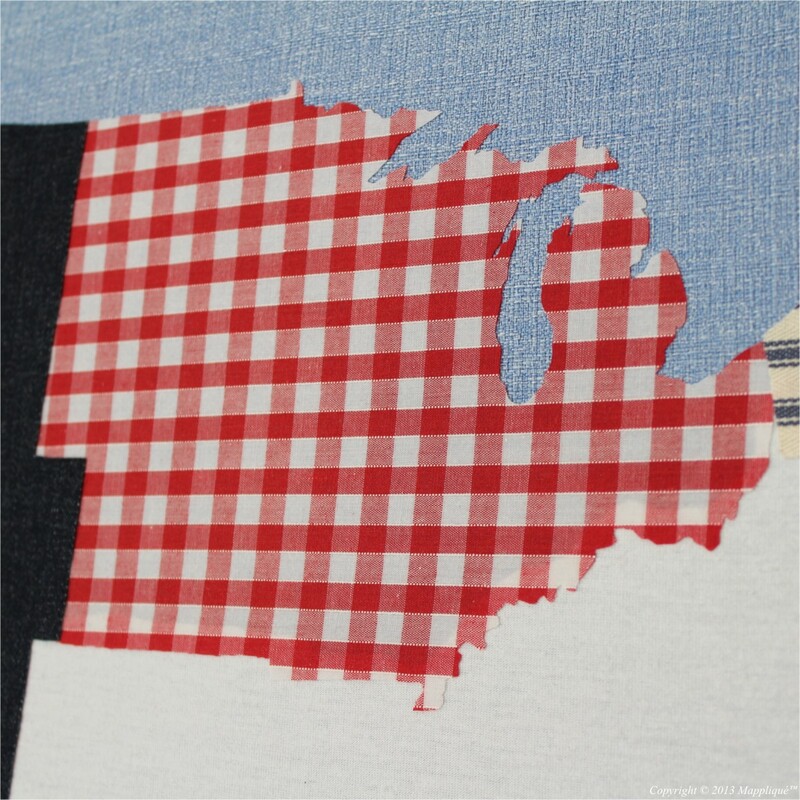 Like denim, the fabric was originally imported but it was the farmsteads across the “belts” of the mid-west (the corn belt, the grain belt, etc) that turned gingham into such an iconic American textile. It was only natural that Kansas-based Dorothy in The Wizard of Oz would wear a gingham dress. 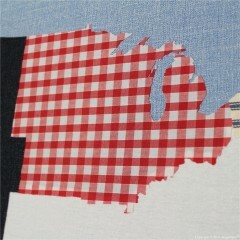 From diner tablecloths to Doris Day, gingham represents the wholesome, milk-fed, farm-grown region of “America’s breadbasket”. 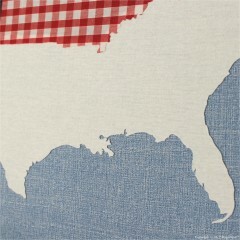 The South must be represented by cotton, and particularly t-shirt cotton. It was the American Navy, with headquarters based in Virginia, that turned the humble undergarment into outerwear by issuing t-shirts to sailors in 1913. In “A Streetcar Named Desire”, set in New Orleans, Marlon Brando cemented the humble white tee as one of the most popular pieces of clothing across the world. 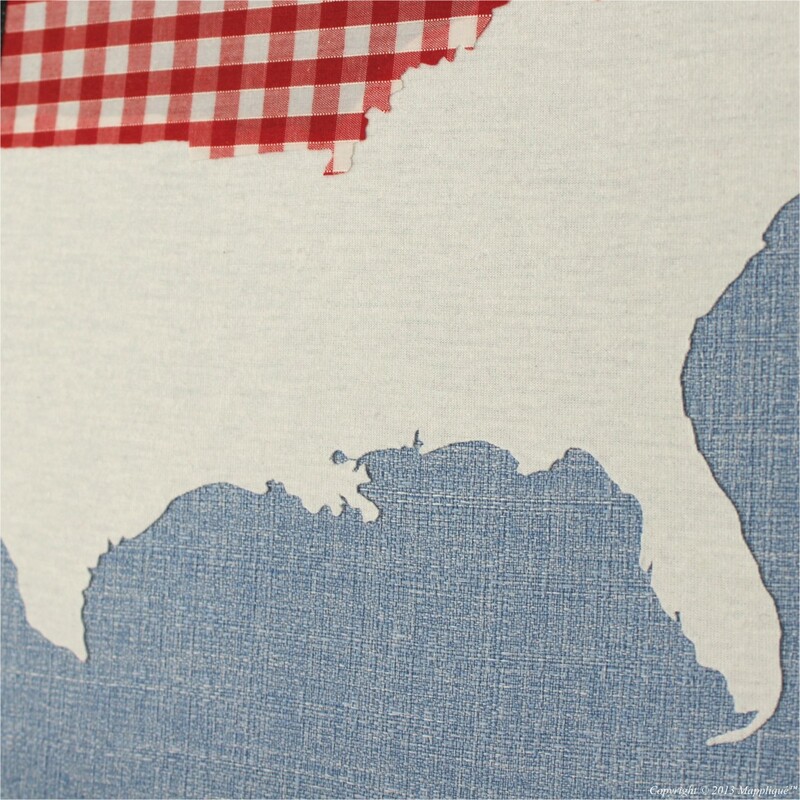 Apart from the historic plantations across the whole of the South in the past, Texas is currently the largest producer of cotton in the USA to this day. For The North-East, mattress ticking is the natural choice, which is ironic for the region that contains the city that never sleeps. The region has a rich history of textile production with numerous mill towns weaving hardy ticking fabrics which endure to this day. 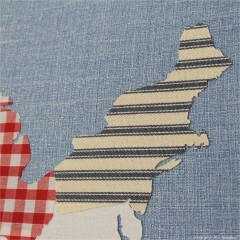 What was once a practical and hard-wearing fabric, the distinctive striped cotton has been repurposed for accessories and upholstery in the typical “New England” coastal-themed interior. All fabric wall art is made to order and personalised with the denim fabric selection of your choice so make sure to select your denim fabric carefully as personalised items are non-returnable. As all original fabric art pieces are made by hand, there will be a variation in pattern and cut which will never exactly match the sample item photographed for this website. As original art pieces are handcrafted using fabrics, take care not to snag them with jewellery when hanging, or spill anything on them that may stain (they’re non-washable).